Petliura, Symon [Петлюра, Симон; Petljura] (pseuds: В. Марченко, В. Салевський, І. Рокитни, С. Просвітянин, О. Ряст; V. Marchenko, V. Salevsky, I. Rokytny, S. Prosvitianyn, O. Riast), b 10 May 1879 in Poltava, d 25 May 1926 in Paris. Statesman and publicist; supreme commander of the Army of the Ukrainian National Republic and president of the Directory of the Ukrainian National Republic. 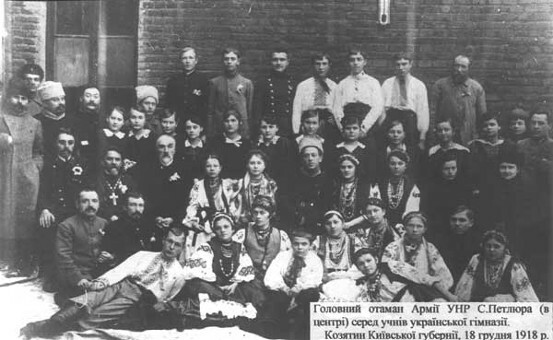 He entered the Poltava Theological Seminary in 1895 but was expelled in 1901 for belonging to a clandestine Ukrainian hromada (see Hromadas), which he had joined in 1898. 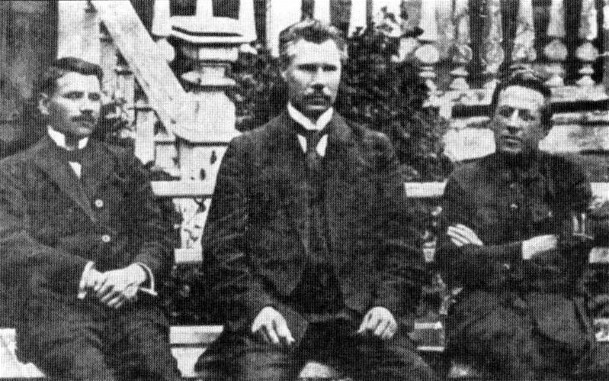 From 1900 he was also active in a political cell in Poltava that became the nucleus of the Revolutionary Ukrainian party (RUP). 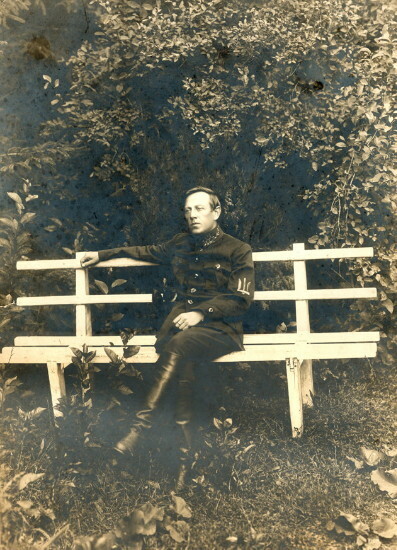 To avoid arrest he moved in the autumn of 1902 to Katerynodar, in the Kuban, where he worked as a teacher and then, under the supervision of Fedir Shcherbyna, cataloged the archives of the Kuban Cossack Army. For his involvement in Katerynodar in the local RUP branch (the Black Sea Free Hromada) and in RUP periodicals (notably Dobra novyna) published in Austrian-ruled Lviv, he was arrested in December 1903. After being released on bail in March 1904, he went to Kyiv and from there, in the autumn, to Lviv to do RUP work and to edit its monthly Selianyn. In 1905, after the general amnesty, he returned to Kyiv. 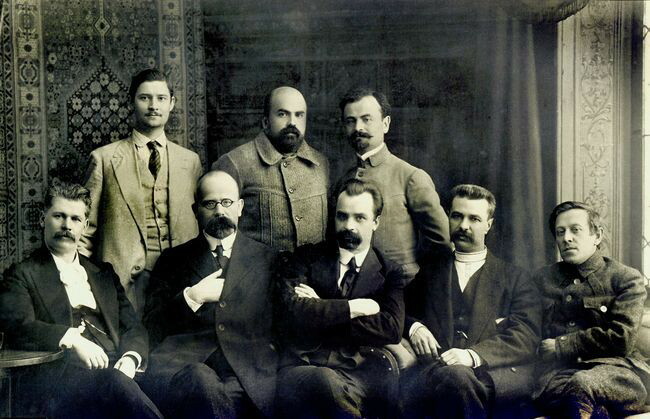 In January 1906 he left for Saint Petersburg to edit, with Prokip Poniatenko and Mykola Porsh, the social democratic monthly Vil’na Ukraïna (Saint Petersburg). After returning to Kyiv in July 1906, he worked as secretary of the newspaper Rada (Kyiv), coedited (in 1907–8) Slovo (Kyiv), the organ of the Ukrainian Social Democratic Workers' party, and contributed to the monthly Ukraïna (1907). In 1909 he moved to Moscow and worked there as a bookkeeper until 1912, when he became coeditor, with Oleksander Salikovsky, of the Russian-language monthly Ukrainskaia zhizn’ (1912–17). In 1916 and until the beginning of 1917 he was deputy plenipotentiary of the All-Russian Union of Zemstvos aid committee on the Russian western front. 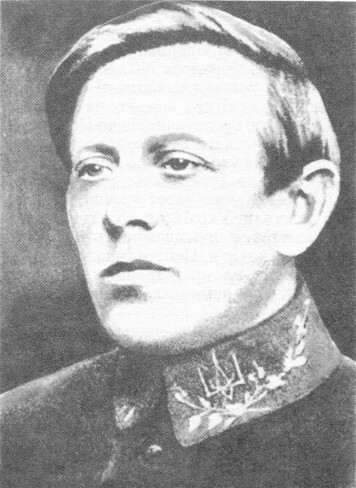 After the February Revolution of 1917 Petliura was elected head of the Ukrainian Military Committee of the Western Front. He was sent as a delegate to the First All-Ukrainian Military Congress (18–21 May 1917; see All-Ukrainian military congresses) in Kyiv, where he was elected chairman of the Ukrainian General Military Committee. 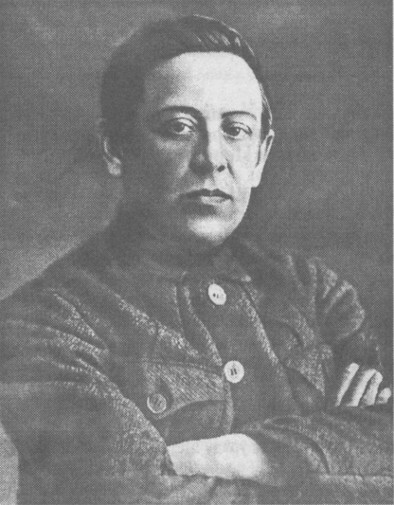 In June 1917 he was appointed general secretary of military affairs in the first General Secretariat of the Central Rada, and directed all his energies to organizing and building up the Ukrainian armed forces, while facing opposition from certain members of the Central Rada as well as open and active hostility from Russian circles. In late 1917, disagreeing with the policies of Volodymyr Vynnychenko, the chairman of the General Secretariat, Petliura resigned and went to Left-Bank Ukraine. 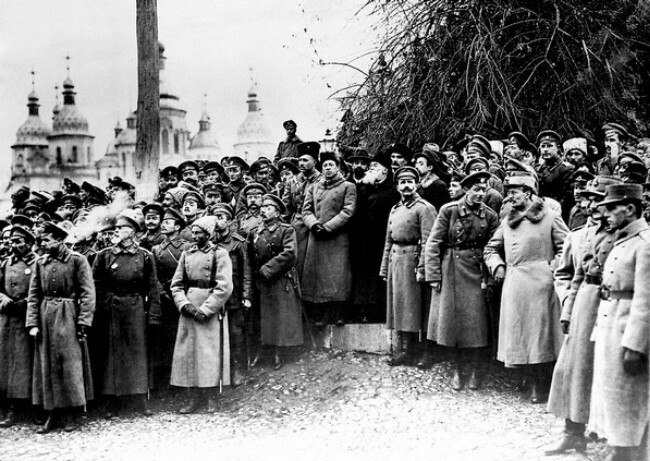 There he organized and commanded the Haidamaka Battalion of Slobidska Ukraine, a military formation that played a decisive role in the January–February 1918 battles for Kyiv and suppression of the Arsenal uprising there. 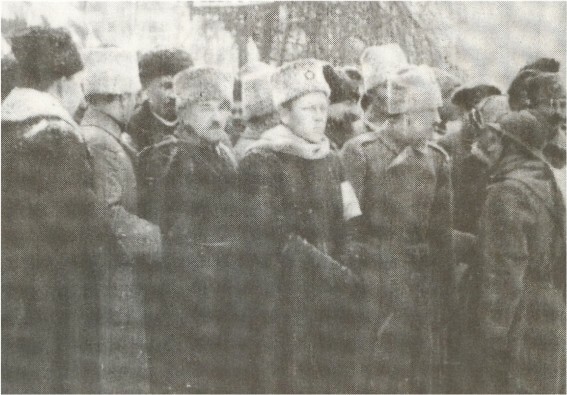 After Hetman Pavlo Skoropadsky's coup in April 1918, Petliura headed the Kyiv Gubernial Zemstvo and All-Ukrainian Union of Zemstvos. He was arrested by the Hetman government in July 1918 but was released after four months, and went to Bila Tserkva. There he took part in the popular uprising against Skoropadsky's regime and was then elected a member of the Directory of the Ukrainian National Republic and supreme otaman of the Army of the Ukrainian National Republic. On 11 February 1919, after the army's retreat from Kyiv and Volodymyr Vynnychenko's flight abroad, Petliura succeeded him as president of the Directory and resigned from the Ukrainian Social Democratic Workers' party. In the difficult conditions of the next 10 months he commanded the UNR Army and later joint UNR Army and Ukrainian Galician Army (UHA) against the Red Army and Volunteer Army (see Ukrainian-Soviet War, 1917–21). 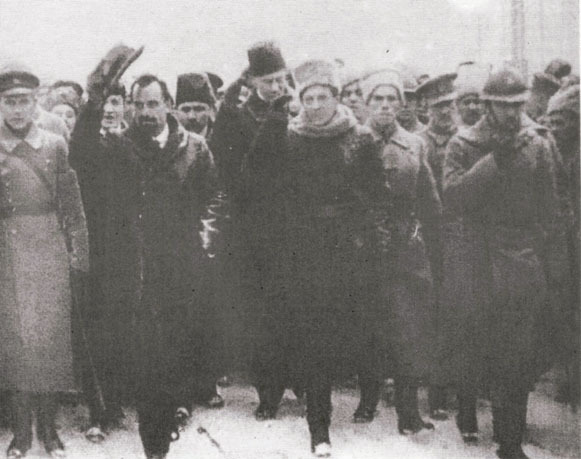 On 5 December 1919, surrounded by the enemy and faced with certain defeat after the UHA established a separate alliance with the Volunteer Army, Petliura and some members of his government fled Ukraine and made for Warsaw in the hope of finding support and allies there. In the meantime Petliura ordered the UNR Army to begin the First Winter Campaign. After the signing of the Treaty of Warsaw in April 1920, the UNR Army under Petliura's command and its Polish military ally mounted an offensive against the Bolshevik occupation in Ukraine. The joint forces took Kyiv on 7 May 1920 but were forced to retreat in June. Petliura’s army fought alongside the Polish forces in the Polish-Soviet war that resulted in turning back the Red Army at Warsaw in August 1920. 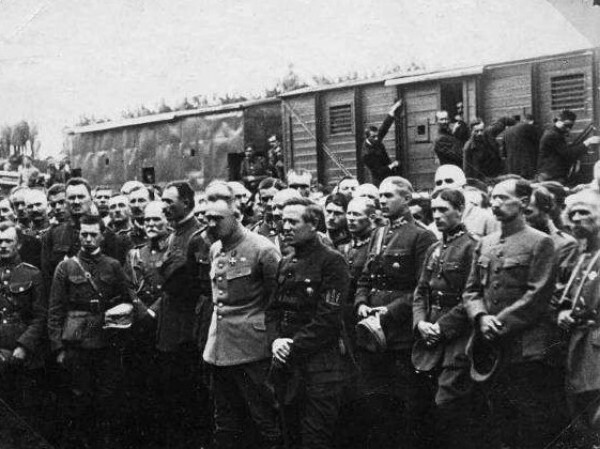 Poland and Soviet Russia concluded an armistice in October 1920, and in November the major UNR Army formations were forced to retreat across the Zbruch River into Polish-held territory and to submit to internment (see Internment camps). Petliura and his government resided temporarily in Tarnów. Later Petliura moved to Warsaw under an assumed name. 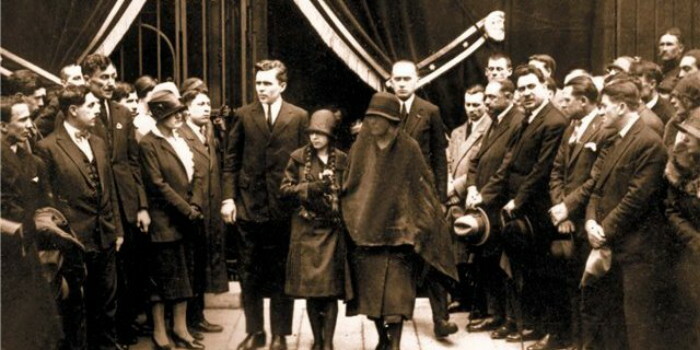 In late 1923, faced with increased Soviet demands that Poland hand him over, he was forced to leave for Budapest. From there he went to Vienna and Geneva, and in late 1924 he settled in Paris. There he founded the weekly Tryzub and oversaw the activities of the Government-in-exile of the Ukrainian National Republic until his assassination by a Bessarabian Jew (Shalom Schwartzbard) claiming vengeance for Petliura's purported responsibility for the pogroms in Ukraine (see Schwartzbard Trial). He was buried in Montparnasse Cemetery. Petliura debuted as a publicist in 1902 in Literaturno-naukovyi vistnyk. There and in the periodicals he edited he published many articles on political, civic, and cultural affairs, particularly on the question of Ukraine's national liberation. His articles had a discernible impact on the formation of Ukrainian national consciousness before the Revolution of 1917. As an émigré in Poland Petliura wrote a brochure on contemporary Ukrainian émigrés and their responsibility (1923). In Tryzub he wrote mainly about the 1917–21 attempts at Ukrainian nation building, the responsibility of émigrés, and Ukraine under Bolshevik rule. The entire 1917–21 period of struggle for Ukrainian statehood is indissolubly linked with Petliura. As a publicist, politician, and military leader he was uncompromising on the issue of Ukrainian independence. Petliura's broad outlook was particularly evident in his definition of the tasks of Ukrainian émigrés and their role in the struggle for Ukrainian statehood. 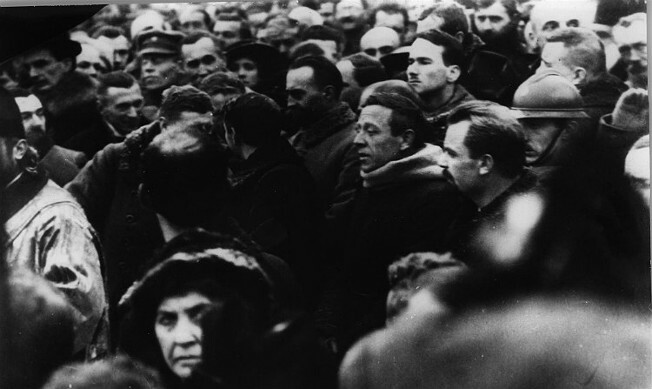 Despite the initially negative, if not openly hostile, attitudes of certain émigré (particularly Western Ukrainian) circles to Petliura because of his central role in the Treaty of Warsaw and the Ukrainian-Polish alliance, since the mid-1920s he has personified, perhaps more than any other person, the Struggle for Independence (1917–20). The personification seemingly also extends to the issue of the pogroms that took place in Ukraine during the revolutionary period of 1918–20, and Petliura has frequently been invested with the responsibility for those acts. Petliura's own personal convictions render such responsibility highly unlikely, and all the documentary evidence indicates that he consistently made efforts to stem pogrom activity by UNR troops. The Russian and Soviet authorities also made Petliura a symbol of Ukrainian efforts at independence, although in their rendition he was a traitor to the Ukrainian people, and his followers (Petliurites) were unprincipled opportunists.